Thassa and Quest for Ula's Temple order? At the beginning of your upkeep, you may look at the top card of your library. If it's a creature card, you may reveal it and put a quest counter on Quest for Ula's Temple. At the beginning of each end step, if there are three or more quest counters on Quest for Ula's Temple, you may put a Kraken, Leviathan, Octopus, or Serpent creature card from your hand onto the battlefield. So, it basically turns every card into a Deep-Sea Kraken ? What about more of a Quest for Ula's Temple type ability? I suggest using Quest for Ula's Temple . Since you use all the Big Water monsters. Quest for Ula's Temple is a trap. Revolves around seems pretty subjective. I'm more used to esper colors so I can't speak for what might be in red that would be interesting. Paradox Haze would be an obvious choice. Then being able to copy that effect with Estrid's Invocation and Copy Enchantment would be obvious. Since the deck must incorporate an upkeep-based theme, Mind Unbound , As Foretold . 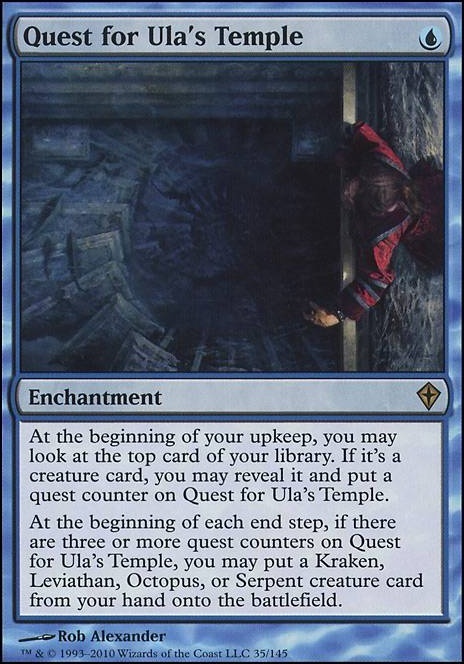 Quest cards like Quest for Ula's Temple end up being resolved pretty quickly too. As AnchroCity said, Krark's Thumb synergizes with the coinflip at upkeep. This could lead to potentially 3 wins per upkeep in terms of coinflips. In that case Chance Encounter might be pretty neat as a wincon. Cards like decent into madness ends up having a factorial effect with the multiple upkeeps (1 counter, then 2, then 3, then 4 means 1+2+3+4 = 10 cards exiled on the first turn after its played) if I'm understanding the wording correctly. This does kill cards with cumulative upkeep costs that aren't in fact benefits like the 3 you've chosen. Thats all I'm willing to think about it for now but it seems like it could be pretty neat. Quest for Ula's Temple might be a card to consider. As you need a lot of mana, how about Zendikar Resurgent ? Also, although it's a little off typewise: Colossal Whale maybe? This is a very cool list nonetheless, so take my +1. 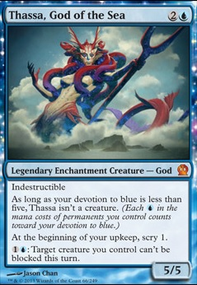 Other than that, I think you need some removal-creatures that give more devotion than what you have currently. 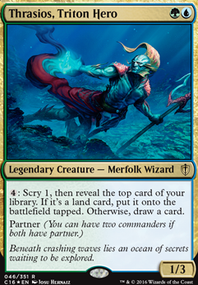 Harbinger of the Tides is a pretty useful one, and Merfolk Trickster can fog a creature for a turn. For some disruption against noncreature decks you could also consider playing Judge's Familiar or Mausoleum Wanderer instead of Kraken Hatchling; while it's a Kraken and fits in the theme of the deck, there really isn't much point in cheating out a 1 mana 0/4 with your Quest. I do suppose it can block, though. 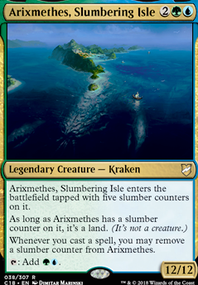 Also, I recommend replacing Tromokratis and Shipbreaker Kraken (and maybe 1 Lorthos) with some combination of Stormtide Leviathan and Inkwell Leviathan. 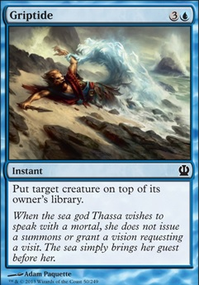 They're less easy to hard-cast, but Tromokratis is mostly worse than Inkwell Leviathan in my opinion, and while Kraken's ability is okay, Stormtide Leviathan is even better at keeping your opponent's creatures at bay. (that rhymed) From my experience playing Whale tribal, Stormtide Leviathan and Scourge of Fleets can completely take control of games when used together. If Tron doesn't appeal to you, why not try a more creature-heavy build centered around Quest for Ula's Temple? You could use creatures like Judge's Familiar and Man-o'-War effects to control the board rather than spells, and get to dropping your big dudes faster. A version like this could also make use of Nykthos, Shrine to Nyx as a backup plan. Each player chooses a opponent, that player gains 20 life.